A six-kilometre-long channel, the Canal de Caronte, leads from the Mediterranean Gulf of Fos into the inland sea Étang de Berre. At its narrowest, along the south shore of the island that encloses the old town of Martigues, its width does not exceed 25 metres. It is into this constricted waterway that the barge carrying the 800-tonne ITER test convoy navigated on Monday 31 March. 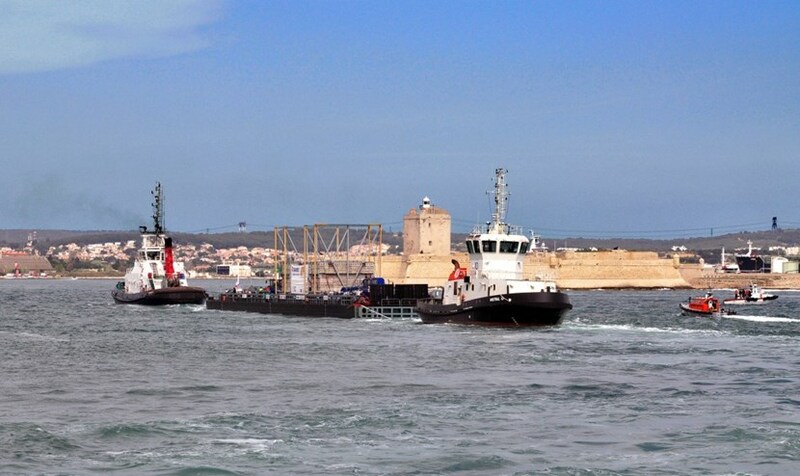 The barge passes the Fort de Bouc lighthouse at the entrance of the oil tanker terminal of Lavéra. Pulled by a powerful tug, followed by still another tug and a pusher-puller workboat, the barge deftly negotiated its passage through the canal and under the Martigues drawbridge, a spectacular sight that marks the entrance into Étang de Berre. 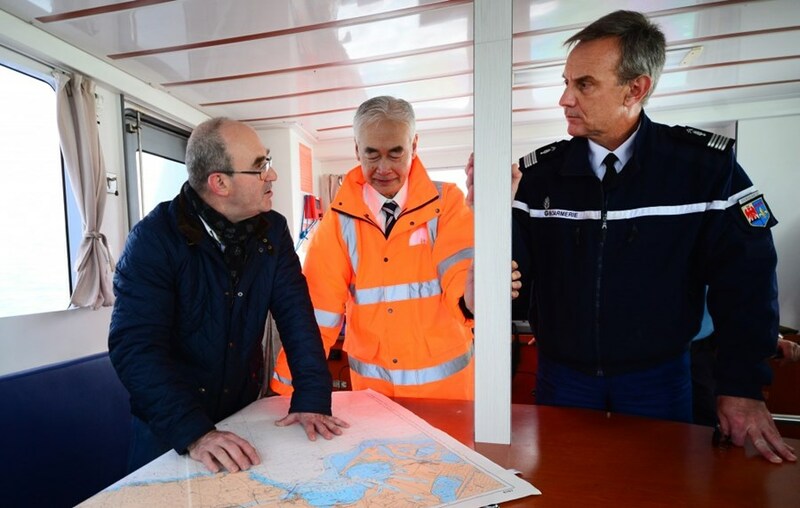 Shortly before the barge entered the channel, ITER Director-General Osamu Motojima—accompanied by Agence Iter France managing director Pierre-Marie Delplanque and Colonel Thierry Cailloz, second in command of the PACA region Gendarmerie—joined her in the Gulf of Fos aboard a Coast Guard (Gendarmerie maritime) patrol boat. 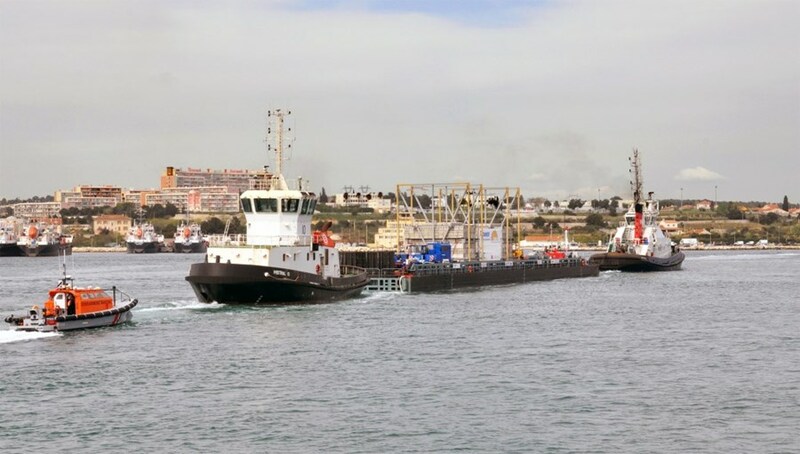 Pulled by a powerful tug, followed by still another tug , the barge enters the six-kilometre-long Canal de Caronte that leads into the Étang de Berre. Due to unfavorable conditions (waves measuring more than one metre) the crossing had been postponed in the morning. But by 2:00 p.m. the waves had abated and the barge was able to safely reach its destination, the LyondellBasell refinery site on the opposite shore of the Étang. Aboard the Gendarmerie Maritime patrol boat, from left to right: Agence Iter France managing director Pierre-Marie Delplanque, ITER Director-General Osamu Motojima and Colonel Thierry Cailloz, second in command of the PACA region Gendarmerie. By Tuesday afternoon, the trailer and its load had been disembarked and had reached the town of Berre. In Berre today, and in Lambesc tomorrow afternoon, Agence Iter France (the CEA agency that coordinates transport on the ITER Itinerary) has organized a "welcome station" where the public can find information on the convoys and their importance for the ITER Project. Click to view the videos posted by the local media La Provence and Maritima-Info.